We invite you all to join us on November 1 for PARCA’s Holiday Crush for the Crash! 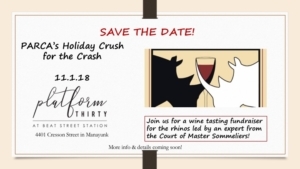 This wine tasting event will feature a special guest who is a member of the Court of Master Sommeliers and who will help you prepare to make great pairings for your holiday parties. We will be at Platform Thirty in Manayunk. Lots more details to follow soon, but we knew you’d want to get this date held on your calendar! Celebrate World Rhino Day with us! Do you know that we celebrate World Rhino Day every September? Well, we do! September 22nd is earmarked to celebrate this iconic animal and PARCA is going to sponsor a FUNdraiser on 9/20. PARCA invites you to celebrate with us by once again taking aim at poaching! We will return to Urban Axes in Philadelphia on Thursday September 20th from 7 – 9 PM. $50 gets you into the (friendly) axe-throwing competition, food, beer, and wine. We will also have baskets you can buy raffle tickets to win and a 50/50 raffle! There will also be PARCA merchandise to buy and this time, our friends from the Philadelphia Chapter of the American Association of Zoo Keepers will also be joining us and selling their merchandise. Do you know that AAZK chapters all over the country hold events during the year that specifically raise money for rhinos? And those events raise over $500,000 combined each year? This is another great reason to come on out and spend an evening helping us partner and do even more for these animals. You can reserve a ticket by electronic payment on PayPal (parcasavesrhinos@gmail.com) or Venmo (PARCA-Inc). You can email us to arrange for cash or check payment as well.